Inclusion is the practice of embracing individuals culturally and socially having different backgrounds. These differences could be- national origin, age, religion/belief, gender, race and ethnicity, marital status, socioeconomic status, educational background, even personality, such as introverts and extroverts. Exceeds financial targets- Greater workplace diversity and inclusion helps to get greater profits. Diverse workforce holds the ability to make better decisions and gives them an advantage over their competitors. Hence they obtain better results. Yields High Performance- Engagement is an outcome of diversity and inclusion. High performance can only be achieved through engagement. Diversity opens the gateway to the best talent. Inclusion engages talent effectively. This leads to improved variation, creativity, productivity, reputation, commitment, and returns. Innovative and Agile- People with different background have different perspectives on their tasks. Their views lead to higher creativity and you have a pot of fresh ideas from different people. When these perspectives combine, they open a door to innovation and thus your organization becomes much more innovative than before. Better Business Outcomes- Workforce diversity increases productivity and profitability by providing social harmony at work for the employees. This helps the organizations achieve better business outcomes and help them to succeed in the global marketplace. 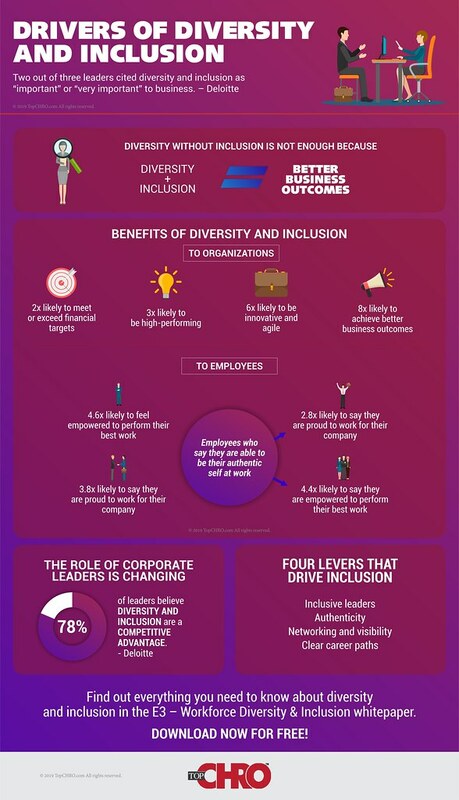 As shown in the infographic, diversity and inclusion in organizations makes the employees feel empowered to perform their best work and they feel proud to work for their company. Today, CHROs ensure diversity and inclusion in organizations. According to Deloitte, 78% of leaders believe diversity and inclusion are a competitive advantage. Unleash the power of diversity and gear up to reap its benefits by recognizing the differences and learning to accept and respect them. Implementing diversity policies instill inclusion, respect, and appreciation in the workplace. If diversity and inclusion are making you inquisitive to know more, go ahead! Download E3- Workforce Diversity and Inclusion Whitepaper to know all about diversity and inclusion. Get things cleared right away so that you don’t fail to recognize opportunities for innovation that might drive your organization forward. Respect diversity and inclusion and go productive!